The Tsinghua Bamboo Slips (simplified Chinese: 清华简; traditional Chinese: 清華簡; pinyin: Qīnghuá jiăn) are a collection of Chinese texts dating to the Warring States period and written in ink on strips of bamboo, that were acquired in 2008 by Tsinghua University, China. The texts were obtained by illegal excavation, probably of a tomb in the area of Hubei or Hunan province, and were then acquired and donated to the university by an alumnus. The very large size of the collection and the significance of the texts for scholarship make it one of the most important discoveries of early Chinese texts to date. On 7 January 2014 the journal Nature announced that a portion of the Tsinghua Bamboo Slips represent "the world's oldest example" of a decimal multiplication table. The Tsinghua Bamboo Slips (TBS) were donated to Tsinghua University in July 2008 by an alumnus of the university. The precise location(s) and date(s) of the illicit excavation that yielded the slips remain(s) unknown. An article in the Guangming Daily named the donor as Zhao Weiguo (赵伟国), and stated that the texts were purchased at "a foreign auction", Neither the name of the auction house, nor the location or sum involved in the transaction were mentioned. Li Xueqin, the director of the conservation and research project, has stated that the wishes of the alumnus to maintain his identity secret will be respected. Similarities with previous discoveries, such as the manuscripts from the Guodian tomb, indicate that the TBS came from a mid-to-late Warring States Period (480–221BC) tomb in the region of China culturally dominated at that time by the Chu state. A single radiocarbon date (305±30BC) and the style of ornament on the accompanying box are in keeping with this conclusion. By the time they reached the university, the slips were badly affected by mold. Conservation work on the slips was carried out, and a Center for Excavated Texts Research and Preservation was established at Tsinghua on April 25, 2009. There are 2388 slips altogether in the collection, including a number of fragments. A series of articles discussing the TBS, intended for an educated but non-specialist Chinese audience, appeared in the Guangming Daily during late 2008 and 2009. The first volume of texts (photographic reproductions, transcriptions, and commentary) was published by the Tsinghua team in 2010. A 2013 article in The New York Times reported on the TBS's importance to understanding the Chinese classics. Sarah Allan, a sinologist at Dartmouth College, stressed the significance of the circa 305 BC date when the bamboo manuscripts were buried, about 100 years before Qin Shi Huang conducted a "literary holocaust" with the (213–210 BC) burning of books and burying of scholars. Professor Allan said that, in predating that textual censorship, "(t)hese manuscripts speak directly to the core issues of the Chinese intellectual tradition and were recorded at the height of the formative period." "The classics are all political", Li Xueqin commented: "It would be like finding the original Bible or the 'original' classics. It enables us to look at the classics before they were turned into 'classics.' The questions now include, what were they in the beginning, and how they became what they are?" Several of the TBS texts are similar to the received Shang Shu, a miscellany of documents from various dates in the first millennium BC that were transmitted as a canonical collection from the Han dynasty onwards. In some cases, a TBS text can be found in the received Shang Shu, with only variations in wording, title or orthography. Such examples include versions of the "Jin Teng" (金滕), "Kang Gao" (康誥) and "Gu Ming" (顧命) chapters of the Shang Shu. The majority of Shang Shu-style TBS texts, however, are not found in the received Shang Shu, either having been "lost" in the process of transmission, or else never having been incorporated into the canonical collection. An annalistic history (編年體史書) recording events from the beginning of the Western Zhou (mid-11th century BC) through to the early Warring States period (mid-5th century) is said to be similar in form and content to the received Bamboo Annals. Another text running across 14 slips recounts a celebratory gathering of the Zhou elite in the 8th year of the reign of King Wu of Zhou, prior to their conquest of the Shang dynasty. The gathering takes place in the ancestral temple of King Wen of Zhou, King Wu's father, and consisted of beer drinking and the recitation of hymns in the style of the received Shi Jing. Among the TBS texts in the style of the received Shang Shu, is one that has been titled "The Admonition of Protection" ("Bao Xun" 保訓). This was the first text for which anything approaching a complete description and transcription was published. The text purports to be a record of a deathbed admonition by the Zhou king Wen Wang to his son and heir, Wu Wang. Although the team working on the text refers to it as "The Admonition of Protection" (or "Protector's Admonition", 保训), their transcription of the text refers to a "Precious Admonition" (Bao Xun) and that may be the more appropriate editorial title. The content of the king's speech revolves around a concept of The Middle (Zhong 中) which seems to refer to an avoidance of extremes and an ability to consider diverse points of view. The king narrates a story of the sage-king Shun acquiring The Middle by living a modest, thoughtful life, and a more puzzling second tale which describes the Shang ancestor Wei (微) "borrowing The Middle from the River." "Xinian" 繫年 (系年), probably composed ca. 370 BC, relates key events of Zhou history. It comprises 138 slips in a relatively well preserved condition. Among the contents they transmit is an account of the origin of Qin by supporters of the Shang dynasty, who were opposed to the Zhou conquest. 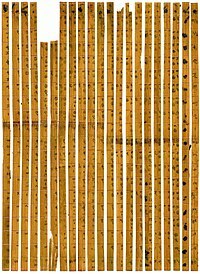 Twenty-one bamboo slips of the Tsinghua Bamboo Slips, when assembled in the correct order, represent a decimal multiplication table that can be used to multiply numbers (any whole or half integer) up to 99.5. Joseph Dauben from the City University of New York called it "the earliest artefact of a decimal multiplication table in the world". According to Guo Shuchun, director of the Chinese Society of the History of Mathematics, those slips filled a historical gap for mathematical documents prior to the Qin Dynasty. It is presumed that officials used the multiplication table to calculate land surface area, yields of crops and the amounts of taxes owed. ^ "清华入藏战国竹简典籍--专家称学术价值不可估量". Tsinghua University News. 2008-10-23. Archived from the original on 2008-10-27. Retrieved 2009-05-14. ^ "Tsinghua Acquires Warring States Bamboo Strips from Chu". Tsinghua University News. 2008-10-24. Archived from the original on 2011-07-07. Retrieved 2009-05-14. ^ a b c d Jane Qiu (7 January 2014). "Ancient times table hidden in Chinese bamboo strips". Nature. Retrieved 22 January 2014. ^ "清华大学"出土文献研究与保护中心"成立". Guangming Daily. 2009-05-04. Retrieved 2009-05-14. ^ "Tsinghua University Unveils Its Center for Excavated Texts Research and Preservation". Tsinghua University News. 2009-04-26. Archived from the original on 2011-07-07. Retrieved 2009-05-04. ^ Didi Kirsten Tatlow (2013-7-10). Rare Record of Chinese Classics Discovered, The New York Times. ^ Li Xueqin (2008-12-01). "初识清华简". Guangming Daily. Retrieved 2009-05-15. ^ "清华简："让人读起来太激动"". Guangming Daily. 2009-04-28. Retrieved 2009-05-15. ^ 姜广辉 (2009-05-04). "《保训》十疑". Guangming Daily. Retrieved 2009-05-14. ^ Li Xueqin 李学勤 (2009-04-13). "周文王遗言". Guangming Daily. Retrieved 2009-05-15. ^ Zhao Pingan 赵平安 (2009-04-13). "《保训》的性质和结构". Guangming Daily. Retrieved 2009-05-14. ^ Yuri Pines, with Lothar von Falkenhausen, Gideon Shelach and Robin D.S. Yates, “General Introduction: Qin History Revisited,” in: Yuri Pines, Lothar von Falkenhausen, Gideon Shelach and Robin D.S. Yates, eds., Birth of an Empire: The State of Qin revisited. Berkeley: University of California Press, 2014:12. ^ "Bamboo math documents called China's earliest". Upi.com. Jan 20, 2014. Retrieved 22 January 2014. Li Xueqin (2010). Qīnghuá Dàxué cáng Zhànguó zhújiǎn (清華大學藏戰國竹簡). Shanghai: Zhongxi Shuju (中西書局). ISBN 978-7-5475-0178-8. Li, Xueqin; Liu, Guozhong (2010). "The Tsinghua Bamboo Strips and Ancient Chinese Civilization". Journal of Chinese Philosophy. 37: 6–15. doi:10.1111/j.1540-6253.2010.01615.x. ISSN 0301-8121.